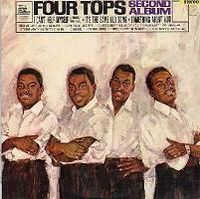 Dr. Rock's Blog & Roll: Album of the Day: The Four Tops (11/13/65) 44 Years! Album of the Day: The Four Tops (11/13/65) 44 Years! Four Tops’ Second Album was released on November 13, 1965 and immediately catapulted the quartet to the top of the pop and R&B charts. The album also moved The Four Tops (mid-50s high school classmates lead singer and baritone Levi Stubbs, bass Renaldo “Obie” Benson, and tenors Abdul “Duke” Fakir and Lawrence Payton) to the top of the heap at Motown Records, where they’d started two years earlier as back-up singers for The Supremes and others. But Second Album meant second singing no more. With three terrific jazz-soul-pop hits, the gritty “I Can’t Help Myself (Sugar Pie, Honey Bunch),” the upbeat “It’s The Same Old Song” and the soulful “Something About You,” the album launched The Four Tops on a four-plus decade run of great singles, albums and concerts, all without a personnel change until Payton’s death in 1997. While their top-selling singles and albums were mostly clustered in the eight years from November 1965, for good reason the group has proved uniquely durable and long-lived in the history of rock, pop and soul music. Despite its three chart hits, Four Tops’ Second Album stalled at #19 on the Billboard pop chart but did make it to #9 on the “Black Albums” chart. It’s available as download tracks from iTunes (click here) and as a CD from Amazon (click here).